corkscrew | Season It Already! Posted on February 13, 2014 by Carrie @ Season It Already! But then there are the times when we really wish we would have brought something! It may be something that seems silly to buy a duplicate or something that you just can’t find, making whatever you are trying to do a real hassle. But don’t take them out when you come home to unpack. This way, you will not forget them next time. Corkscrew – Of course, if you don’t drink wine, this might not apply to you. But think of something else you always do on vacation. Do you buy local beer at the store? Then a bottle opener would be in order. (Most corkscrews also are also part bottle opener!) Do you like to buy local food or produce or go to the market and have a picnic with all of your findings? Then these Reusable Picnic Utensils are in order. Please Note: If you do not check your luggage, you cannot carry on a corkscrew. Leave it at home. First Aid Kit – You can buy a Travel First Aid Kit already put together and tightly compacted for you. Or you can put one together yourself. Just make sure you include your most used items that apply to you. If you tend to get blisters or stomach aches while on vacation, be sure to stock your kit with plenty of band-aids and antacids. For a list of what to include in a travel first aid kit, click here. Umbrella – Our first two days in St. Augustine, Florida, were unseasonably cold and rainy. (I’m not complaining! It was still 60 degrees warmer than Minnesota and beautiful and sunny the following days.) I forgot an umbrella. We ended up doing just fine without one. But it got me thinking… I do have two of them. I might as well just keep one in my suitcase. I often pack it in my carry-on, but this might be a better idea so I don’t forget in the future. I’d recommend a light, compact one. Just search for “travel umbrella” online, purchase and voila! You’ll be prepared every time. Are there any that remain in your suitcase so that you don’t forget to pack them? 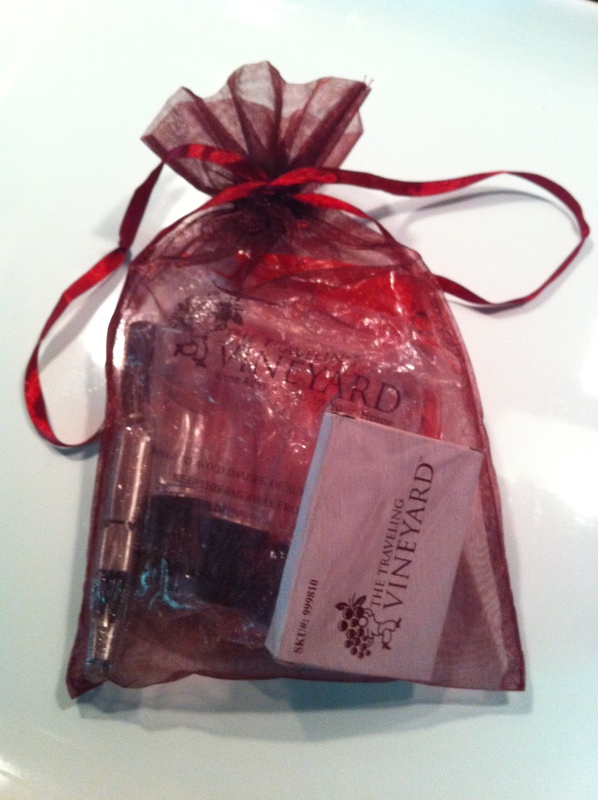 Have Corkscrew, Will Travel – First Giveway! Posted on July 11, 2012 by Carrie @ Season It Already! 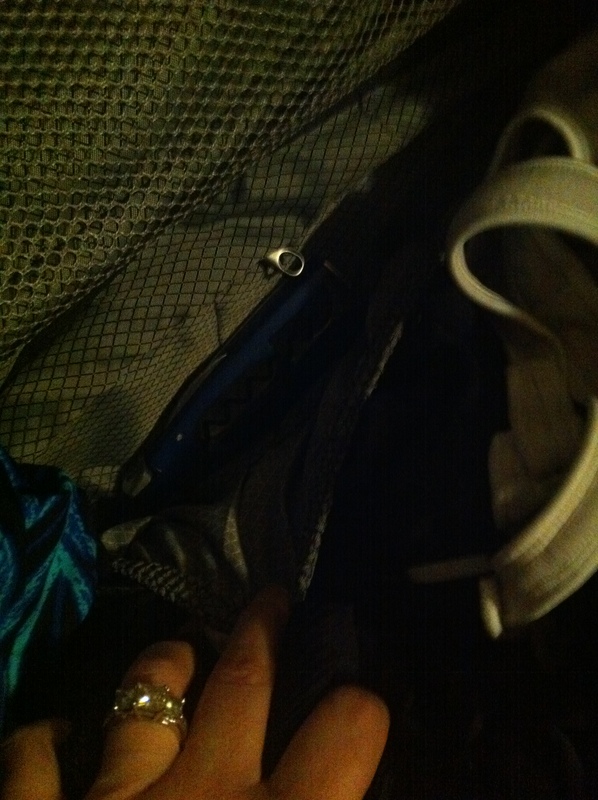 I keep something blue in my luggage… Can you see it? 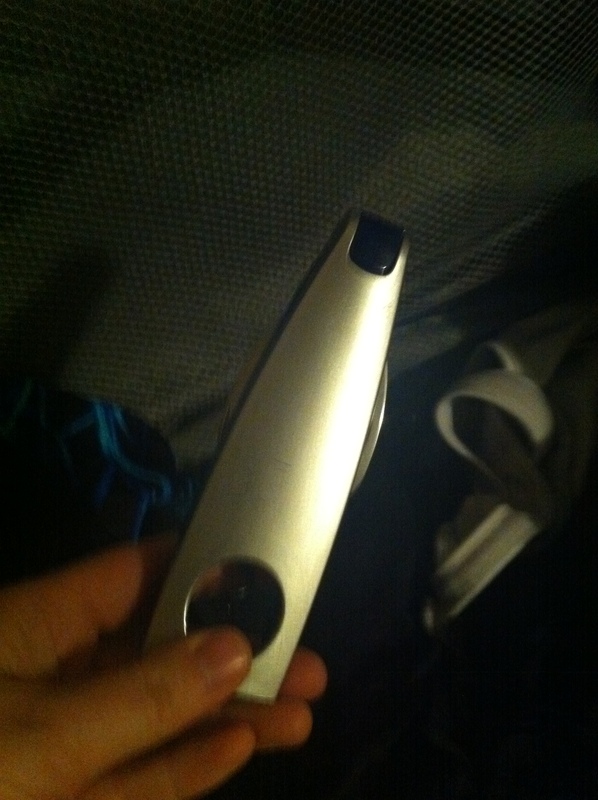 This corkscrew stays in that pocket in my suitcase. I do not remove it upon return from vacation. Why? I never know when I’ll need a corkscrew on vacation! This way, I don’t ever have to remember to pack it. A little tip from me to you. Of course, this is in my suitcase that I check when I’m flying. You don’t want to carry a corkscrew in your carry-on bag. It will most likely be confiscated at security. At a friend’s or family member’s house. Seriously, some people don’t own them. For this reason, I’ve had Wine Tasting guests state that they actually keep a spare corkscrew in their purse or glove compartment. Brilliant! You can never have too many corkscrews. So today I’m doing my first ever giveaway! 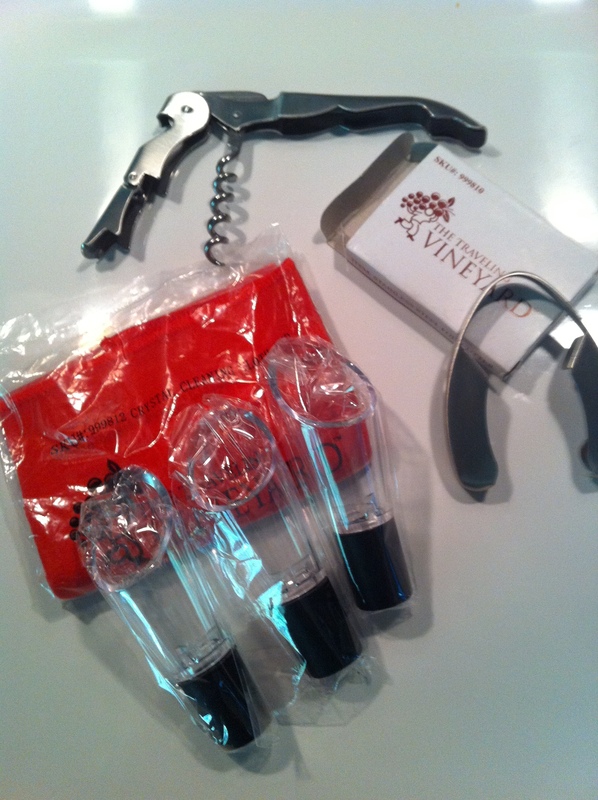 Wine Accessory Package – perfect for gift giving! Crystal cleansing cloth – perfect for those pesky water spots! The Wine Lovers Accessory Package is also available for purchase on my website or at a Wine Tasting event. Hosts can receive up to 50% off the Wine Lovers Accessory Package! An unusual place you keep a corkscrew. Someplace you’ve needed a corkscrew and were without one. The giveaway will be open until Monday 7/16/12 11:59pm CST. The winners will be announced on the next Wine Wednesday: 7/18/12. Good luck!